How are we already mid March? I feel like this year is flying. We had some pretty nice weather this weekend, so we took advantage of that before the storms come our way once again. Ugh. I am so ready for summer. Anyways, Friday after work, we grabbed a quick lunch and then Rory dropped me off to get a glorious pedicure. It was so needed. After he picked me up, we headed to Target to get some Easter basket things plus some staples for the house. I will be sharing what is in the girls Easter baskets on Thursday for Girl Chat. Don't forget to link up. After Target, we headed home where I went to the Strange Bikinis store opening with a friend of mine. The bikinis fit differently this year, so sadly I walked out empty handed. But I did score some yummy cookies. I went home and picked up Rory and then we went to pick the girls up from daycare. That evening we made our last Hello Fresh meal and it was sooooo good. The pork tenderloin with a figgy balsamic sauce was amazing. We ate every last bit. Even the girls asked for seconds. I can't wait to make it again, but a larger portion for sure. Saturday morning we headed out to breakfast since we didn't have much in the house. We went to our favorite breakfast place and then ran some errands to get dog food and return the girls sandals I purchased from Old Navy that were too small. But we did manage to buy them more stuff due to the great sales. 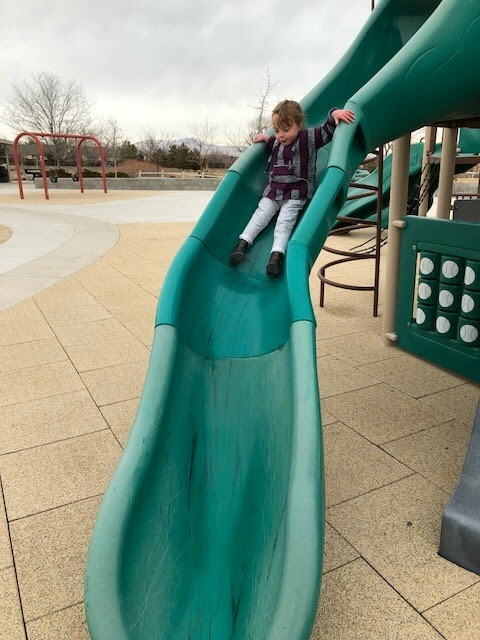 After Old Navy, we headed to the park to let the girls burn off some energy. It was still chilly out, but the girls didn't mind because they were running around. I on the other hand was cold. 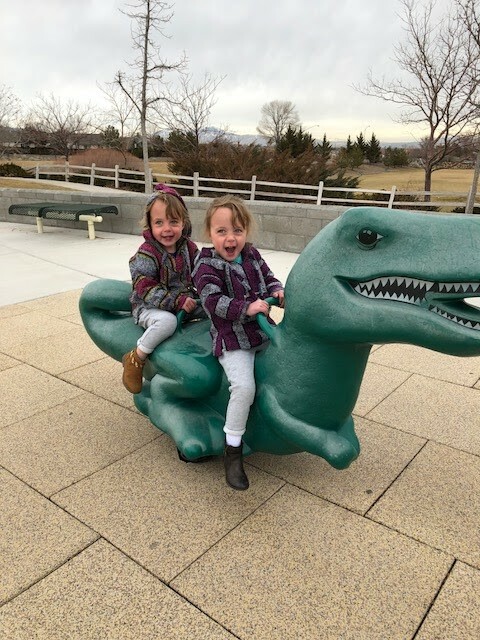 In the middle of their play time, Rory went to a Starbucks that was 3 minutes away and grabbed us some coffees, so the girls could play longer. After the park, we headed home. We made the girls some lunch and then they went down for their naps. Rory worked on cleaning up the garage while I did some organizing in the house. Once the girls got up, it started to rain. They helped Rory in the garage while I ran to the store to grab a few things that I needed for some pudding cookies. 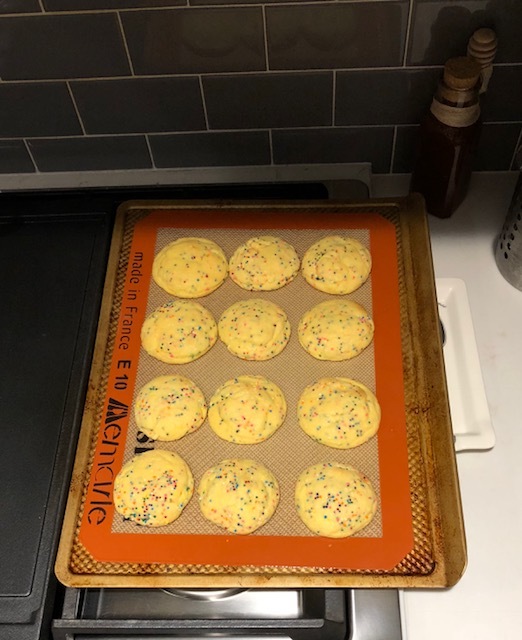 The girls helped me bake cookies and they turned out great. I made the girls a quick dinner while Rory went out and got himself some ramen for dinner. Once he got back, I headed out to Mexican with my friend Heather. It was soooo good to see her. I haven't seen her since before my Ireland trip as I was super sick once I got back and then she had a lot of photoshoots once I was better. We dined on yummy chips and salsa plus a chimichanga with salsa verde for me and fajitas for her. Plus we had margaritas. After dinner, we headed to a speakeasy which I had no idea existed in Reno. I had this yummy drink that is a play off of a screwdriver. It has vodka, fresh orange juice, bitters, and one other liquor in it that I can't remember. It was really good. We just sat and chatted with some of her friends. I headed home around 11 pm since we had daylight savings coming up and I knew the girls wouldn't sleep in. Spoiler: they didn't. Sunday morning the girls got up at their normal time of 6:30 (on the weekends) which was actually 7:30. It really threw off the whole day with the time change, but I feel like the time changes are harder now that we have kids. We made breakfast, protein pancakes and bacon with coffee. After breakfast, I did some cleaning around the house. I also organized my closet and went through all of my shoes. We loaded up my car full of stuff to donate and then waited for my parents to get to our house. 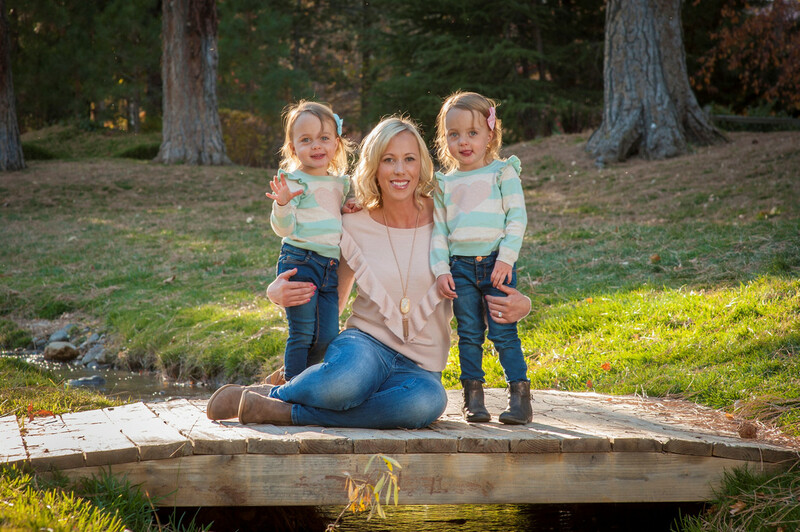 They have been gone for almost 2 week in Florida, so the girls were super excited to see them. They brought the girls back all sorts of Minnie Mouse things from Disney World. The girls were in heaven. They told us all about their trip and all the fun things they did. Complete with lots of great photos. I am soooo glad my parents had a great time on their trip which was also a 35th wedding anniversary celebration. The girls had lunch while my parents were there and then went down at 2 pm instead of 1 pm due to the time change. Once the girls were asleep, I headed to the grocery store. I got back in time to watch the last of the bracketology and see where Nevada falls. Nevada is a 7th seed and they will play Texas on Friday in Nashville. Go Pack!!! Once the girls were up, we took them out in their Jeeps since it was 61 degrees. 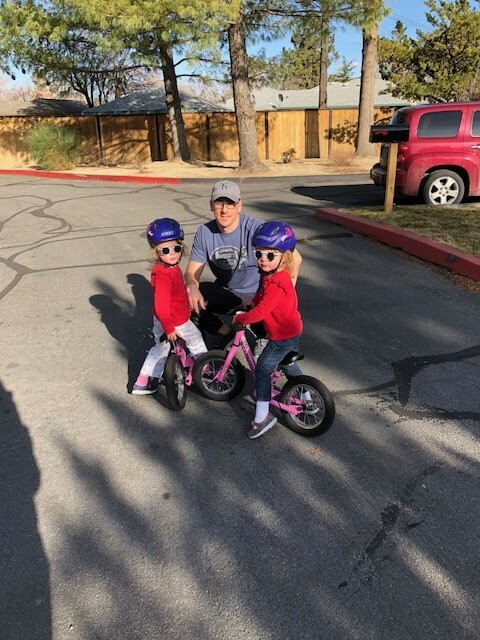 Then they rode their strider bikes around the neighborhood before getting too tired and wanting to head home. Once we got home, I started making dinner. Rory had a few items left to clean up in the garage, so he took care of that. 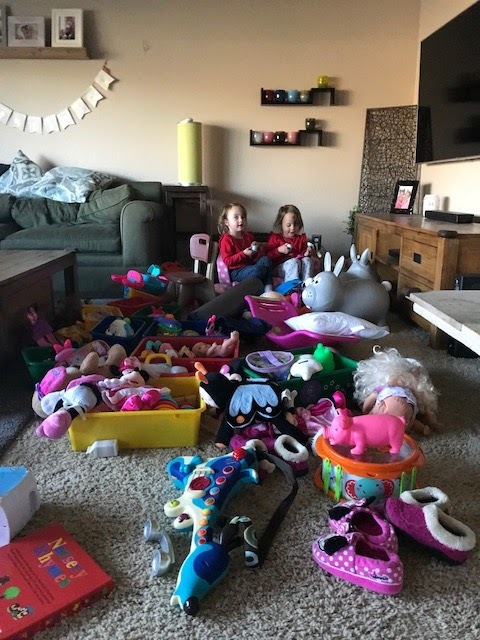 In the 10 minutes that he was in the garage, the girls managed to bring out almost all of their toys from their room out to the living room. The only things they didn't bring were all the kitchen supplies (thank god) and most of their books plus nothing from their closets. Rory saw it first and then filmed it when I saw it. I was surprised to say the least. I did laugh because just wow. How many trips did they make to bring all of this out? The girls told us they were going on a train and needed to bring all of their toys. Ha. While my sauce for our meatball subs was simmering, I helped them clean up. Once everything was back in their room, I finished dinner. The girls even ate the subs with an apple and arugula salad. After dinner, I gave the girls a bath and then got them ready for bed. They were in bed by 7:45, but didn't go to sleep until after 8:30. Time changes are rough on kids. After the girls were finally asleep, we watched LA to Vegas and some interview with Nevada on their seeding and game ahead. Do you work half days Fridays? Old Navy has been killing it with their sales lately!! I can't stop shopping LOL Sounds like you had a great weekend!! Kids are productive when they're motivated hahaha, that mess though! Wow--impressive hahah. Sounds like a good weekend. Cookies, mexican, play time OUTDOORS (so jealous)! It doesn't get much better! Bummer about the swim suit situation though. haha! Your children are so funny!! I can't stop laughing at the picture of them and all the toys. That is alot of carryon for the train. haha. I love their pink jeep!! It's amazing what kids can do when you turn your back for a minute! Those girls have a great imagination! Yum, our kids would love those cookies. I'm going to have to try them sometime! That is so funny. Dont you wish you had a video of the girls getting all that stuff out there so quickly? That had to be hilarious. We have a park near here that looks similar to the one you went to! We were going to go to a speakeasy this weekend too but none were open! Sounds like a great weekend - that playground looks like so much fun! The sales at ON lately are so good.... dangerous. ;) Hope your Monday is going well! Those cookies look so yummy! 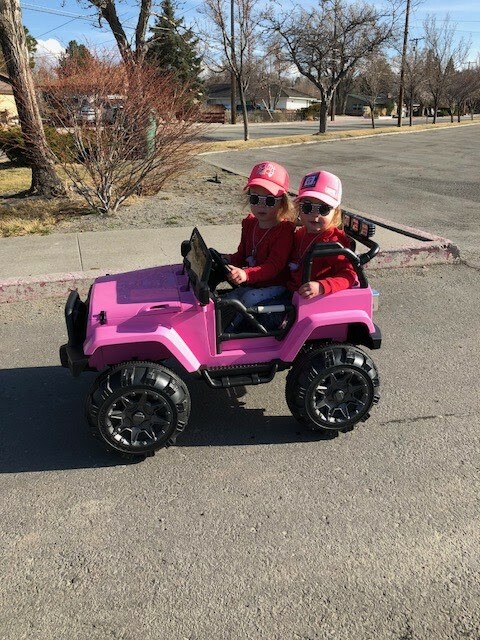 I love the pic of the girls in the Jeep together with their hats on. I’ll bet yiur pedicure looks great! Happy Monday!! They are really good and easy to make. I love the girls in their Jeeps. So much fun. My pedicure is beautiful. Hot pink!!! Have a great week! What a fun weekend! 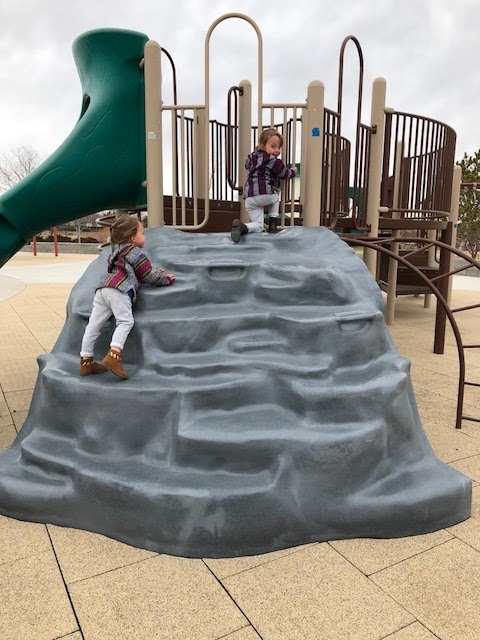 I'm glad you all were able to enjoy some time outside, even if it was a bit too chilly for you on Saturday. I'm so ready for some warmer weather. Mm...those cookies look super yummy!! Yes, definitely needed it as the storm is rolling in today. I am sooo ready for Spring and Summer. The cookies are definitely a must make. So good. Full weekend! The speakeasy sound amazing! YAY for pedicures- I finally got one a few weeks ago and it was so overdue. It's the perfect way for me to relax. I I am SO ready for consistent good weather- enough of this white stuff! I shopped the Old Navy sale too and got Bella her first pair of jellies- I couldn't resist for such a good price. Hope your week is great!